This recipe is super easy and delicious. The chicken thighs turn out perfect and juicy every time. 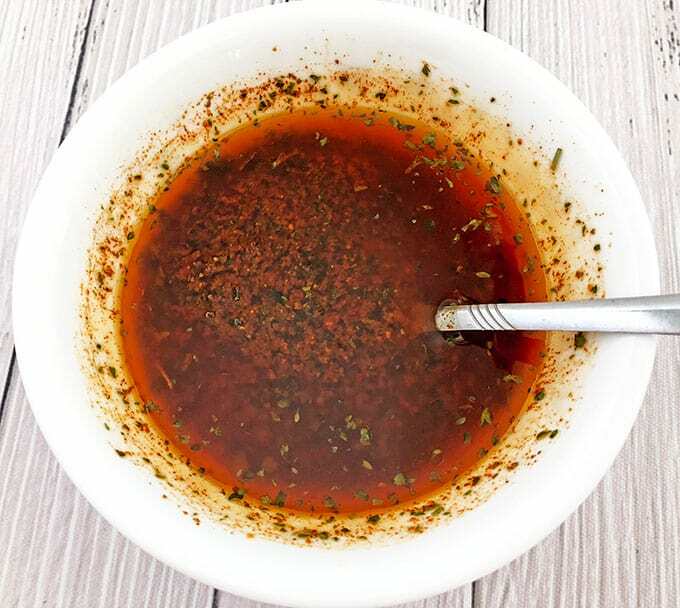 If you are looking for a crowd pleasing recipe, you found the one! 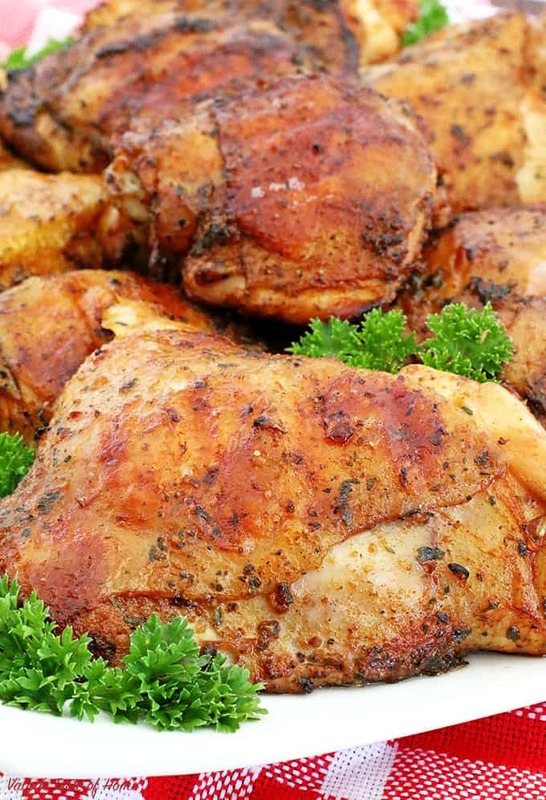 Chicken thighs are the juiciest and most flavorful part of a chicken. Marinade the chicken thighs overnight and all you’ll have left to do is grill it for dinner. While you grill the chicken, you can make the main dish, salad, and you will have dinner ready on the table in 30 minutes. How easy is that? This recipe is super juicy, tender on the inside, crispy on the outside and finger licking delicious. 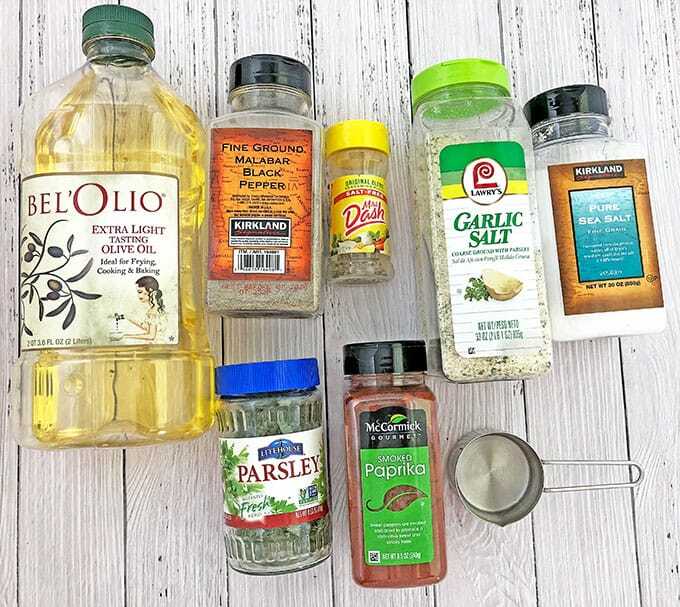 So, if you’re looking to put a flavorful and budget-friendly dinner on the table, then let’s fire up the grill and give this recipe a try! 1. Trim off extra skin and fat of the thighs. 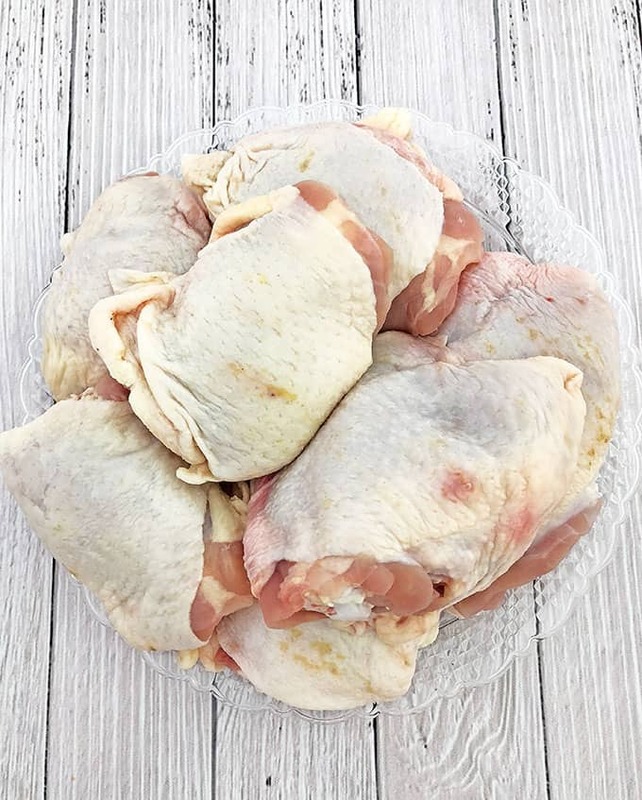 Place chicken thighs into a large bowl of water. Sprinkle with 2 tbsp of sea salt and let the chicken soak for 30 minutes. Then rinse the chicken thighs and place them into a strainer. 2. Measure out the dry ingredients into a small bowl. Add water, olive oil and stir the ingredients together. 3. Place chicken thighs into a gallon Ziplock bag and pour marinade sauce over the chicken thighs. 4. Close Ziplock bag tightly, coat the chicken into the marinade sauce and refrigerate overnight or at least 12 hours. 1. Heat the grill to 350 F (180 C). Place the chicken thighs onto the grill. Maintain the temperature in the grill between 320 F – 350 F. Grill the chicken for 15 minutes. 2. Flip the chicken thighs over to the other side and grill them for an additional 10 – 15 minutes or until cooked thoroughly. 3. 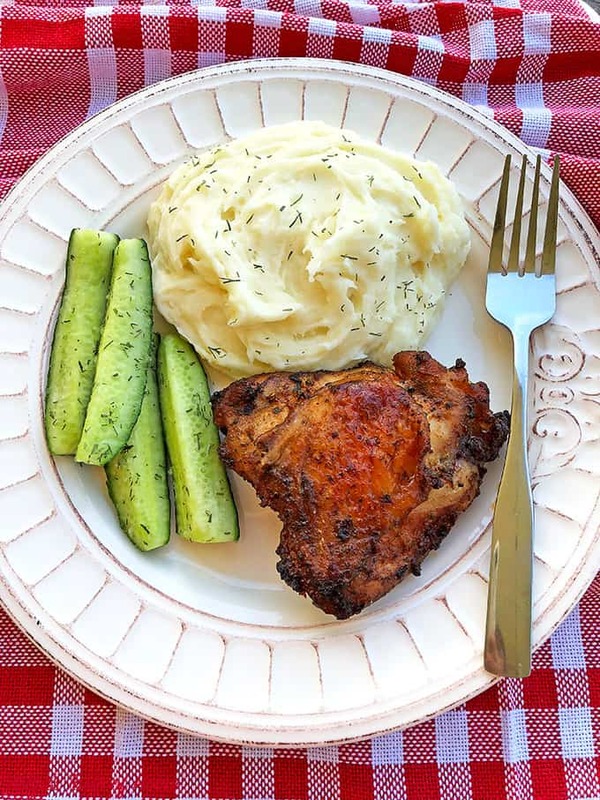 Remove from the grill and serve with creamy mashed potatoes and marinated garlic cucumber salad or a side of your choice. 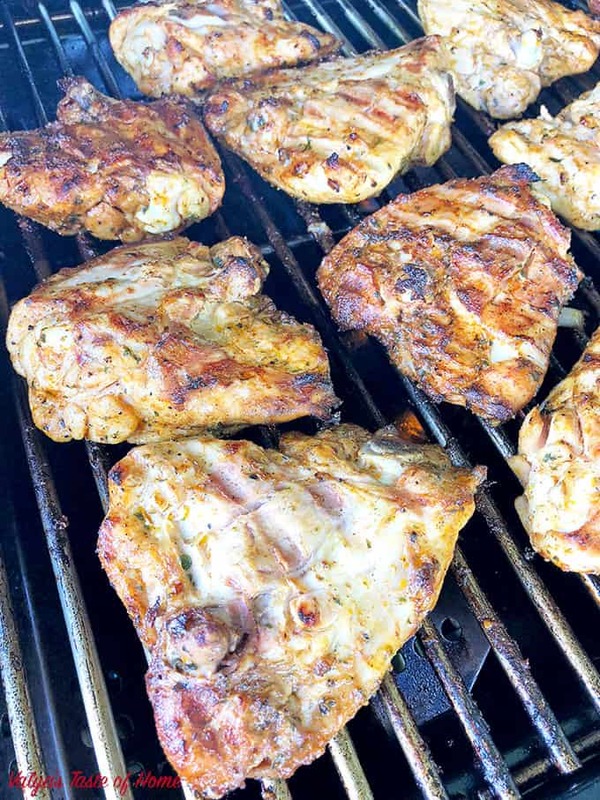 If you make this Grilled Marinated Chicken Thighs Recipe please share a picture with me on Facebook, Instagram or Pinterest. Tag with #valyastasteofhome. I’d love to see your creations! ? Trim off extra skin and fat of the thighs. 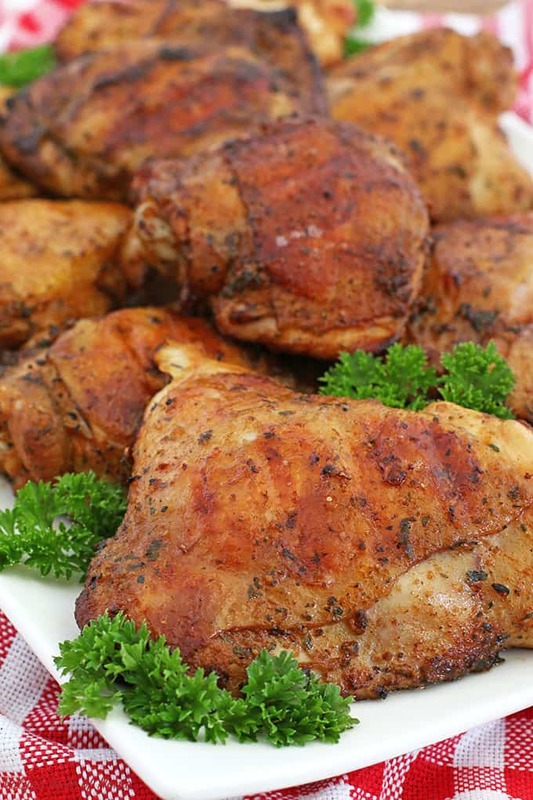 Place chicken thighs into a large glass bowl of water. Sprinkle 2 tbsp. of sea salt and let the chicken soak for 30 minutes. Rinse chicken thighs and place them into a strainer. Measure out dry ingredients into a small bowl. Add water, olive oil and stir all together. 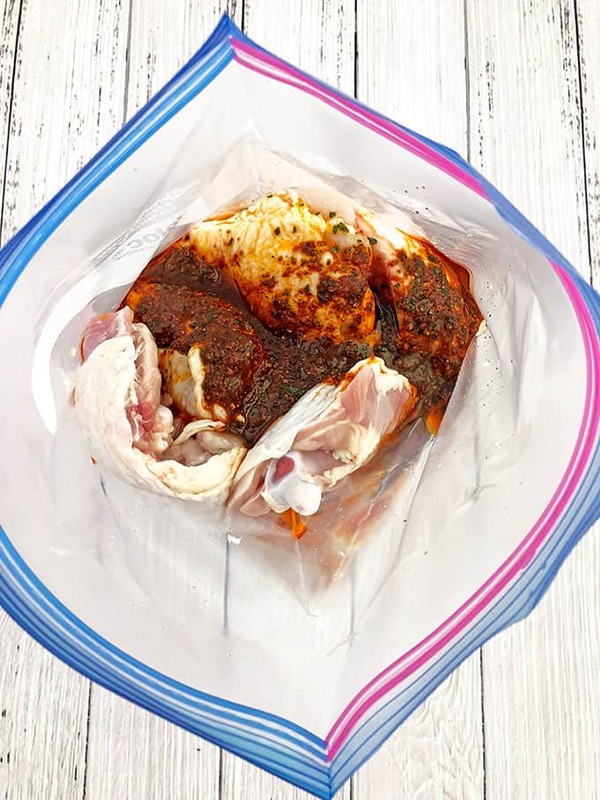 Place chicken thighs into a gallon Ziplock bag and pour marinade over the chicken thighs. 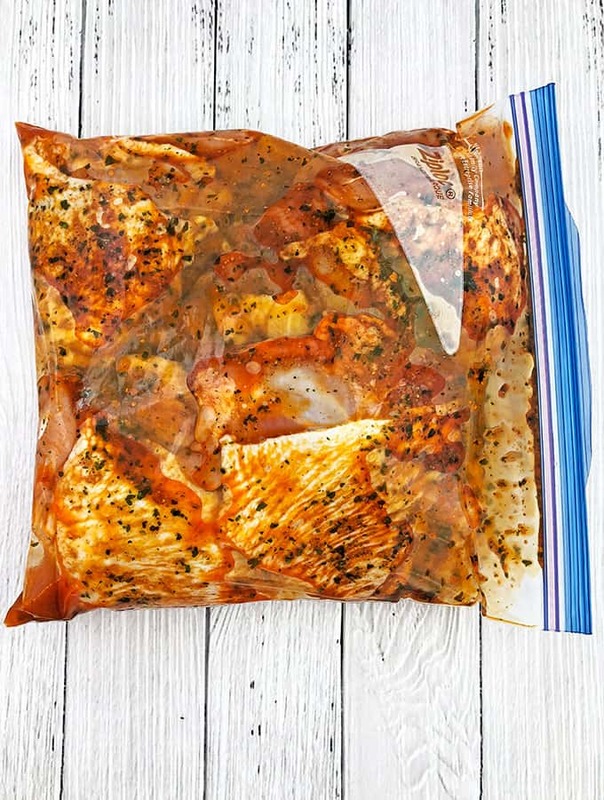 Close Ziplock bag tightly, coat the chicken into marinade and refrigerate for at least 12 hours in the fridge. Heat the grill to 350 F (180 C). Place chicken thighs onto the grilling rack. 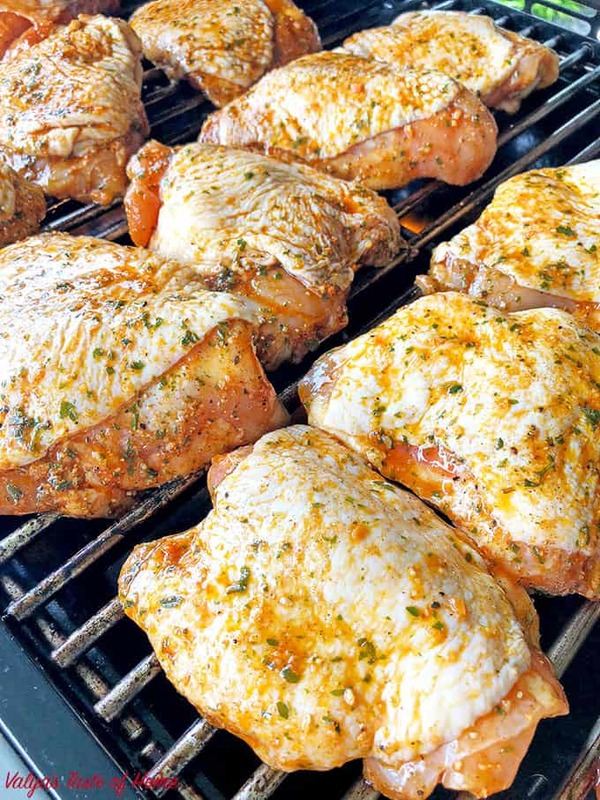 Reduce grilling setting to low to maintain the temperature between 320 F – 350 F. Grill the chicken for 15 minutes. 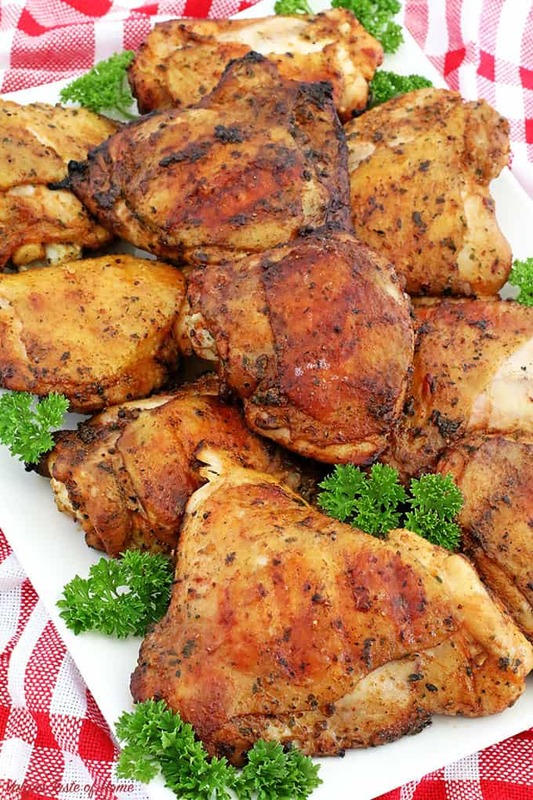 Turn the chicken thighs over to the other side and grill it for an additional 10 – 15 minutes or until cooked through. Remove from the grill and serve with creamy mashed potatoes and marinated garlic cucumber salad or the side of your choice. Yes, I used a bone in chicken thighs. That’s a great question, thank you for asking! Can you bake these in the oven? If yes, at what temperature and for how long? Yes, absolutely! I have bake in the oven recipe. Follow those instructions.